Check out a clip from Pharrell and Scott Vener’s OTHERtone Beats 1 show ahead of its debut. This weekend sees a handful of firsts for Beats 1, Apple Music's worldwide radio station. Yesterday brought the debut shows from Q-Tip, Run the Jewels, and Disclosure, today is the premiere of Dr. Dre's "The Pharmacy," and tomorrow brings Pharrell Williams and famed music supervisor Scott Vener's "OTHERtone." For their first installment, Williams and Vener had help running through the "newness, freshness, and what-is-that-ness" of the artists currently on their radar. 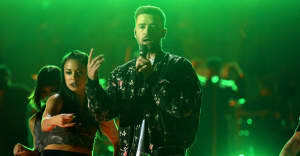 Surprise guests Justin Timberlake and Cara Delevingne stopped by to nerd out with them over one of their favorites, Alabama Shakes, and you can preview what went down in the exclusive clip above. "This band is incredible," Timberlake said, before describing the Shakes' lead singer Brittany Howard "[as if] Nina Simone, Minnie Riperton and Janis Joplin all had a love child." Tune into OTHERtone tomorrow at 3 p.m. ET, and look for it every other Sunday on Beats 1.